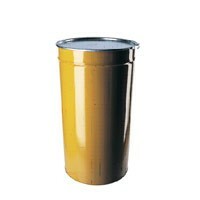 Conical drums are internally coated and externally painted and are available in 210 ltrs, Suitable for filling of 225kg packed aseptic bag. Due to its structure and dimensions, a conical drum allows exceptional efficiency during transportation and storage. Overall external diameter of the drum makes it possible to store 4 drums in line that suits stuffing of 80 drums in a 20 ft. shipping container. It is also possible to transport up to 1368 empty drums in a 40 ft. Container. Once filled, drums can be stacked 3 to 4 high with the pallets. Conical drums may be returned and reused. Reduces cost of transportation and storage due to conical shape, allowing them to nest in. Reduced cost of returning the drums by end users since the drums can be nested. Epoxy phenolic inside lining/ food grade internally painted, in accordance with FDA standards. Non-toxic polish added to the paint, specially recommended by tomato paste packaged in aseptic bags. Galvanized metallic ring with adjustable lever and security seal to improve the quality.